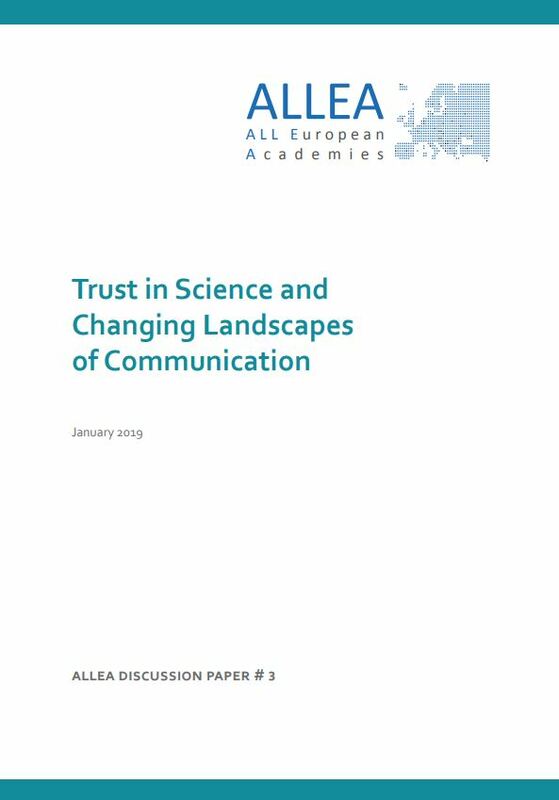 ALLEA published the discussion paper “Trust in Science and Changing Landscapes of Communication” today. The paper examines how the increasing use of social media and other digital transformations affect and challenge trust relations between science, media and society. In response to these challenges, the paper discusses the development of new tools for fact-checking and quality control of scientific information online. The authors urge political leaders to back and value scientific methods and standards of research integrity, and support digital innovations to overcome threats to public reasoning and scientific discourse. The discussion paper reflects the conclusions of a workshop held by the ALLEA Working Group “Truth, Trust & Expertise” at the Royal Netherlands Academy of Sciences and Arts in Amsterdam in August 2018. The expert group, chaired by Baroness O’Neill of Bengarve and Professor Ed Noort, is a transnational platform for perspectives on the nature and relationship between truth, trust and expertise in the field of science and research. The discussion paper “Trust in Science and Changing Landscapes of Communication” and all preceding issues can be found here. For press inquiries, interviews with experts or requests of hard copies please contact Susana Irles (irles@allea.org). For content related inquiries please contact Daniel Kaiser (kaiser@allea.org). ALLEA and Re-Imagine Europa have organised the international forum “Democracy in a Digital Society – Trust, Evidence and Public Discourse in a Changing Media Environment”, taking place on 24 January, at the Berlin-Brandenburg Academy of Sciences and Humanities. On this occasion, Baroness O’Neill of Bengarve and Professor Christiane Woopen will discuss the findings of the ALLEA Working Group Truth, Trust and Expertise with a wider audience alongside contributions by EU Commissioner Mariya Gabriel, Manuel Castells and other prominent speakers from policy, academia and civil society. For further information on the event and a livestream please click here.